by Chris Woodford. Last updated: November 5, 2018. Have you ever done one of those spot-the-difference newspaper puzzles where you have to find the missing details using two very similar cartoons? The quick way to solve them is to cut out the two images, place one on top of the other, and shine a light through the paper. It might sound like cheating but it's actually science: you're using the light pattern from one image to show up differences in the other. Scientists use a very similar process called interferometry to measure small things with incredibly high accuracy by comparing light or radio beams. Let's take a closer look at how it works! 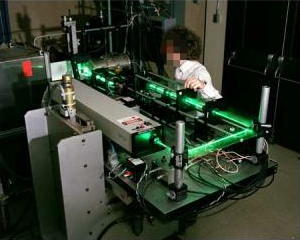 Photo: A laser interferometer. The laser beam is split into two parts. One part travels straight to a detector while the other undergoes a change of some sort. By comparing the two beams again at the end, you can measure the extent of the change very precisely. Photo courtesy of NASA Glenn Research Center (NASA-GRC). To understand interferometry, you need to understand interference. In everyday life, interference simply means getting in the way or meddling, but in physics it has a much more specific meaning. Interference is what happens when two waves carrying energy meet up and overlap. The energy they carry gets mixed up together so, instead of two waves, you get a third wave whose shape and size depends on the patterns of the original two waves. When waves combine like this, the process is called superposition. If you've ever sat making waves in a bath-tub, you'll have seen interference and superposition in action. If you push your hand back and forth, you can send waves of energy out from the center of the water to the walls of the tub. When the waves get to the walls, they bounce back off the hard surface more or less unchanged in size but with their velocity reversed. Each wave reflects off the tub just as if you'd kicked a rubber ball at the wall. Once the waves come back to where your hand is, you can make them much bigger by moving your hand in step with them. In effect, you create new waves that add themselves to the original ones and increase the size of their peaks (amplitude). When waves add together to make bigger waves, scientists call it constructive interference. If you move your hands a different way, you can create waves that are out of step with your original waves. When these new waves add to the originals, they subtract energy from them and make them smaller. This is what scientists call destructive interference. Constructive interference means combining two or more waves to get a third wave that's bigger. The new wave has the same wavelength and frequency but more amplitude (higher peaks). Destructive interference means waves subtracting and canceling out. The peaks in one wave are canceled by the troughs in the other. The extent to which one wave is in step with another is known as its phase. If two identical waves are "in phase," it means their peaks align so, if we add them together, we get a new wave that's twice as big but otherwise exactly the same as the original waves. Similarly, if two waves are completely out of phase (in what we call antiphase), the peaks of one exactly coincide with the troughs of the other so adding the waves together gives you nothing at all. In between these two extremes are all sorts of other possibilities where one wave is partly in phase with the other. Adding two waves like this creates a third wave that has an unusual, rising and falling pattern of peaks and troughs. Shine a wave like this onto a screen and you get a characteristic pattern of light and dark areas called interference fringes. This pattern is what you study and measure with an interferometer. An interferometer is a really precise scientific instrument designed to measure things with extraordinary accuracy. The basic idea of interferometry involves taking a beam of light (or another type of electromagnetic radiation) and splitting it into two equal halves using what's called a beam-splitter (also called a half-transparent mirror or half-mirror). This is simply a piece of glass whose surface is very thinly coated with silver. If you shine light at it, half the light passes straight through and half of it reflects back—so the beam-splitter is like a cross between an ordinary piece of glass and a mirror. 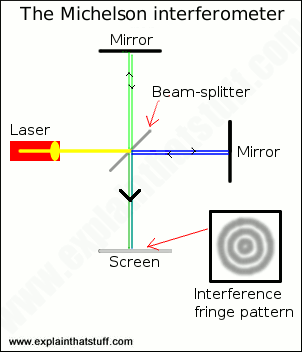 One of the beams (known as the reference beam) shines onto a mirror and from there to a screen, camera, or other detector. The other beam shines at or through something you want to measure, onto a second mirror, back through the beam splitter, and onto the same screen. This second beam travels an extra distance (or in some other slightly different way) to the first beam, so it gets slightly out of step (out of phase). Artwork: How a basic (Michelson) interferometer works. If we take the green beam to be the reference beam, we'd subject the blue beam to some sort of change we wanted to measure. The interferometer combines the two beams and the interference fringes that appear on the screen are a visual representation of the difference between them. When the two light beams meet up at the screen, they overlap and interfere, and the phase difference between them creates a pattern of light and dark areas (in other words, a set of interference fringes). The light areas are places where the two beams have added together (constructively) and become brighter; the dark areas are places where the beams have subtracted from one another (destructively). The exact pattern of interference depends on the different way or the extra distance that one of the beams has traveled. By inspecting and measuring the fringes, you can calculate this with great accuracy—and that gives you an exact measurement of whatever it is you're trying to find. Instead of the interference fringes falling on a simple screen, often they're directed into a camera to produce a permanent image called an interferogram. In another arrangement, the interferogram is made by a detector (like the CCD image sensor used in older digital cameras) that converts the pattern of fluctuating optical interference fringes into an electrical signal that can be very easily analyzed with a computer. What are the different types of interferometers? Photo: Albert Einstein solved the "failed" Michelson-Morley interferometer experiment with his theory of relativity. Photo courtesy of US Library of Congress. The Michelson interferometer (named for Albert Michelson, 1853–1931) is probably best known for the part it played in the famous Michelson-Morley experiment in 1881. That was when Michelson and his colleague Edward Morley (1838–1923) disproved the existence of a mysterious invisible fluid called "the ether" that physicists had believed filled empty space. The Michelson-Morley experiment was an important stepping-stone toward Albert Einstein's theory of relativity. The Fabry-Perot interferometer (invented in 1897 by Charles Fabry, 1867–1945, and Alfred Perot, 1863–1925), also known as an etalon, evolved from the Michelson interferometer. It makes clearer and sharper fringes that are easier to see and measure. The Fizeau interferometer (named for French physicist Hippolyte Fizeau, 1819–1896) is another variation and is generally easier to use than a Fabry-Perot. It's widely used for making optical and engineering measurements. The Mach-Zehnder interferometer (invented by German Ludwig Mach and Swissman Ludwig Zehnder) uses two beam splitters instead of one and produces two output beams, which can be analyzed separately. It's widely used in fluid dynamics and aerodynamics—the fields for which it was originally developed. The Sagnac interferometer (named for Georges Sagnac, a French physicist) splits light into two beams that travel in opposite directions around a closed loop or ring (hence its alternative name, the ring interferometer). It's widely used in navigational equipment, such as ring-laser gyroscopes (optical versions of gyroscopes that use laser beams instead of spinning wheels). The Twyman-Green interferometer (developed by Frank Twyman and Arthur Green in 1916) is a modified Michelson mainly used for testing optical devices. Most modern interferometers use laser light because it's more regular and precise than ordinary light and produces coherent beams (in which all the light waves travel in phase). The pioneers of interferometry didn't have access to lasers (which weren't developed until the mid-20th century) so they had to use beams of light passed through slits and lenses instead. Artwork: Fiber-optic interferometry. Most interferometers pass their beams through the open air, but local temperature and pressure variations can sometimes be a source of error. If that matters, one option is to use a fiber-optic interferometer like this. A laser (red, 12) shoots its beam through lenses (gray, 16a/b) into a pair of fiber-optic cables. One of them (blue, 18) becomes the reference beam, bouncing its light straight onto a screen (orange, 22). The other (green, 20) allows its beam to reflect off something that's being measured (such as a vibrating surface) into a third cable (green, 30). The reference and reflected beams meet up and interfere on the screen in the usual way. 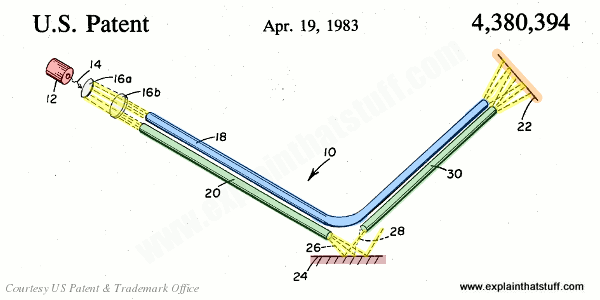 Artwork from US Patent 4,380,394: Fiber optic interferometer by David Stowe, Gould Inc., April 19, 1983, courtesy of US Patent and Trademark Office. A state-of-the-art interferometer can measure distances to within 1 nanometer (one billionth of a meter, which is about the width of 10 hydrogen atoms), but like any other kind of measurement, it's subject to errors. The biggest source of error is likely to come from changes in the wavelength of the laser light, which depends on the refractive index of the material through which it's traveling. The temperature, pressure, humidity, and concentration of different gases in the air all change its refractive index, altering the wavelength of the laser light passing through it and potentially introducing measurement errors. Fortunately, good interferometers can compensate for this. Some have separate lasers that measure the air's refractive index, while others measure air temperature, pressure, and humidity and calculate the effect on the refractive index indirectly; either way, measurements can be corrected and the overall error is reduced to perhaps one or two parts per million. What are interferometers used for? 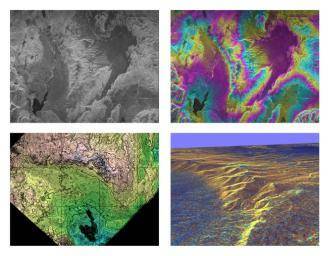 Photo: Interferometry in action: These 3D topographical maps of Long Valley, California were made from the Space Shuttle using a technique called radar interferometry, in which beams of microwaves are reflected off Earth's contours and then recombined. Photo courtesy of NASA Jet Propulsion Laboratory (NASA-JPL). Interferometers are widely used in all kinds of scientific and engineering applications for making precise measurements. By scanning interferometers over objects, you can also make very detailed maps of surfaces. By "precise" and "detailed", I really do mean precise and detailed. The interference fringes that an optical (light-based) interferometer produces are made by light waves traveling fractionally out of step. Since the wavelength of visible light is in the hundreds of nanometers, interferometers can theoretically measure lengths a couple of hundred times smaller than a human hair. In practice, everyday laboratory constraints sometimes make that kind of precision hard to achieve. Albert Michelson, for example, found his ether-detecting apparatus was affected by traffic movements about a third of a kilometer away! Astronomers also use interferometers to combine signals from telescopes so they work in the same way as larger and much more powerful instruments that can penetrate deeper into space. Some of these interferometers work with light waves; others use radio waves (similar to light waves but with much longer wavelengths and lower frequencies). Photo: The Keck interferometer. 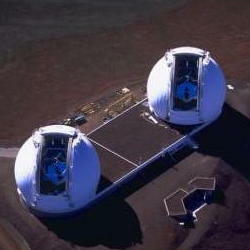 Astronomers have linked the two 10-m (33-ft) optical telescopes in these domes on Mauna Kea, Hawaii to make what is effectively a single, much more powerful telescope. Photo courtesy of NASA Jet Propulsion Laboratory (NASA-JPL). Interferometry is also helping us to figure out the secrets of gravity. 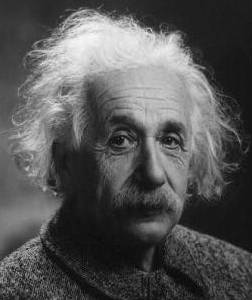 In 2017, three US physicists (Rainer Weiss, Barry Barish, and Kip Thorne) shared the Nobel Prize in Physics for the discovery of gravitational waves ("ripples in spacetime"), originally predicted by Albert Einstein over a century ago. Their experiment is called LIGO (Laser Interferometer Gravitational-Wave Observatory) and uses two very large laser interferometers with arms 4km (2.5 miles) long, located in two different places 3000km (1800 miles) apart, at opposite ends of the United States (Hanford, Washington and Livingston, Louisiana). PDF: Optical Interferometry Motivation and History by Peter Lawson, NASA JPL.These slides come from a 2006 talk by a NASA expert on interferometry. They explain the theory and practice of interferometry and how it's used in astronomy and space science. The Michelson Interferometer: This great page from the Department of Physics, Middlebury College, VT, clearly describes several good interferometer experiments for college-level students: measuring the wavelength of laser light, comparing the wavelength of different light sources, and measuring the refractive index of air. It also describes the measuring procedure step by step. PDF: NASA: Guideline for use of Fizeau interferometer in optical testing: NASA's in-house guide to making accurate measurements. PDF: Nobel Prize in Physics 2017: Cosmic Chirps: A simple explanation of how laser interferometry helped scientists detect gravitational waves. Basics of Interferometry by P. Hariharan. Academic Press, 2007. Begins with a primer about interferometers before going on to cover different techniques and applications. The Very Large Telescope Interferometer: Challenges for the Future by Paulo J. V. García, Andreas Glindemann, Thomas Henning (eds). Springer, 2003. What does the future hold for astronomical interferometry? Nobel prize in physics awarded for discovery of gravitational waves by Hannah Devlin and Ian Sample, The Guardian, October 3, 2017. How the LIGO interferometers shone new light on gravity. Faster Than the Speed of Light? by Danny Hakim, The New York Times, July 22, 2013. How NASA engineers are using interferometry to test the feasibility of a "warp drive." Four telescope link-up creates world's largest mirror by Katia Moskvitch. BBC News, 3 February 2012. How interferometry was used to link up four telescopes at the Paranal Observatory in Chile. Two become one: Giant telescopes linked: BBC News, 15 March 2001. A brief news report on how the Keck telescopes were combined to make the Keck interferometer. Six telescopes act as one: BBC News, 19 March 2002. Reports of another astronomical interferometry experiment. New interferometer measures to atomic dimensions by Katie Walter, Science and Technology Review, October 1997. US Patent 4,575,246: Michelson interferometer by Nishizawa Seizi et al. March 11, 1986. Describes a modern Michelson interferometer for use in Fourier spectroscopic analysis. US Patent 4,278,351: Interferometer by James B. Breckinridge, et al, NASA, July 14, 1981. A high-resolution interferometer designed to avoid misalignment effects. US Patent 3,419,331: Single and double beam interferometer means by George Diehr, Optomechanisms Inc, December 31, 1968. A dual single and double beam instrument that combines the advantages of both devices.